When homeowners think about a kitchen remodel a lot of their attention is focused on what material to use for countertop materials. That’s not surprising, either because your counters (along with your cabinets) play a huge role in how your kitchen looks and feels. But your countertops are more than “eye candy” for your kitchen. Depending on how much cooking you do (and what kind of cooking), your counters can be extremely hard-working elements in your kitchen. That’s why it’s so important to pick materials that look great and stand up to the kind of use you’re going to give them. If you’re thinking about upgrading your kitchen, which countertop material is right for you? There are plenty of colors, textures, and materials from which you can choose. 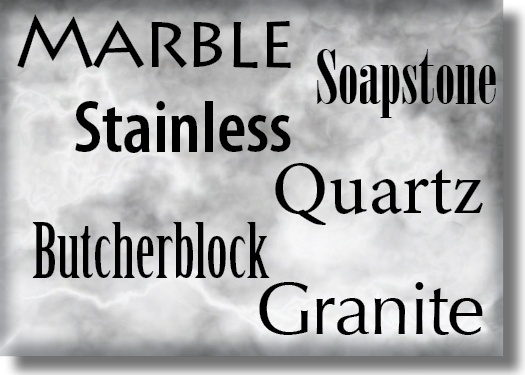 Should you go with granite, quartz, stainless steel, soapstone, or an engineered stone? What about a butcher-block surface? If you click here and take a look through the KITCHENS section of our photo gallery, you’ll see a wide variety of materials we’ve installed in numerous kitchens in the Naples area. You’ll find everything from warm earth tones to sleek modern surfaces—depending on the design of the kitchen. But what about functionality and durability? We found an informative (and fun!) online quiz at Better Homes and Gardens that can help you evaluate the different characteristics of the many choices available to you. Click here to take the quiz! Of course there’s nothing quite like seeing the materials in person—and being able to ask a real person questions. A virtual tour of our showroom gives you a taste of what’s available. Then you can visit the showroom at 13500 Tamiami Trail N #10 Naples, FL 34110 to get a hands-on look at your options.